Kudos to you! You've officially decided to sign up for a new class at the gym—kickboxing to be exact—but now comes the tricky part: packing your fitness bag with the appropriate workout gear. Well, have no fear, as we put together a guide for what to wear to kickboxing that will ensure you'll pack a punch in the proper attire. Kickboxing, much like running or other high-intensity, high-sweat workouts, requires a handful of essentials that are supportive without being too restrictive because, well, there's a lot of jumping and kicking involved in the sport. So think a comfortable sports bra that won't budge, an airy tank top, moisture-wicking leggings, and a pair of lightweight, flexible sneakers that won't weigh you down. See—we did all the thinking for you. Now all you have to do is click "add to cart." Read on to shop the four essentials to wear to your next kickboxing session. This sports bra is perfect for kickboxing, as it "locks up to provide unparalleled support with rapid, high-impact activity." 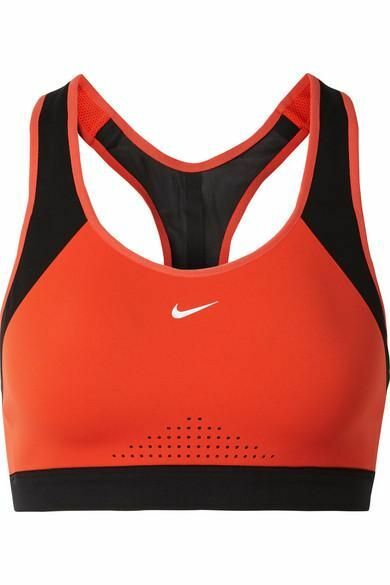 This sleek sports bra has a supportive band that ensures a secure fit—even during the most intense of workouts. Available in sizes 38D to 44L. Cute and comfortable. What more could you ask for? This tank top is the definition of sporty-chic. These leggings are breathable and are designed to keep you cool and dry—perfect for a high-intensity, high-sweat kickboxing session. Another pair of sleek, moisture-wicking leggings. Plus, they have a double-layered waistband to offer extra support to your core. These sneakers are lightweight, so they won't weigh you down during jumps and kicks, and they're made of flexible mesh, allowing you to freely move your foot during the high-intensity workout. For kickboxing, look for sneakers that have a cushioned insole for extra support and comfort like these Adidas Originals. Up next, shop the cutest gym bags in which to pack all of your kickboxing essentials.